Only 47.7 million for firms with 500 or more. And in other parts of the world the numbers are even higher. Uncorporate SME's drive the world, just not the stock market. Private companies have a profound effect on the overall economy and are major drivers of capital investment and innovation. Dad has been a tremendous father, coach and mentor, and has taught me to hire great people, treat them great, be humble and ask lots of questions. Everyone is special in some way. My Dad shook hands with everyone. People want to be recognized; take care of them, and they’ll take care of the customers. Arrived home one Christmas night to have dinner with family. There was a handwritten note from Dad. “You’ve got the rest of your life to change the world, but you’ve only got one shot at raising those four kids. Merry Christmas." As young children my father taught us the importance of integrity above all else. He was fond of saying that a person’s reputation is their legacy–taking years to build and only minutes to destroy. Why aren’t we told this on the nightly news? WANT TO SHARE THE FACTS? 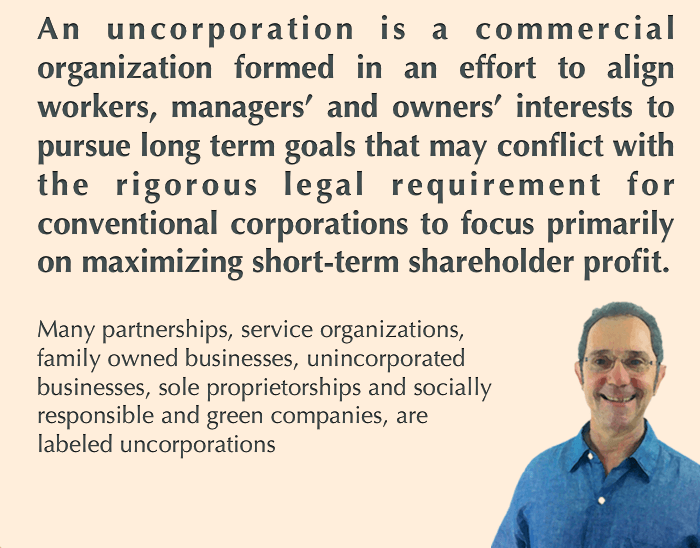 Share the truth: the real facts about uncorporate businesses like yours, the engine of the World's economies? Get a free one page report.